Why Do We Fear Enlightenment? 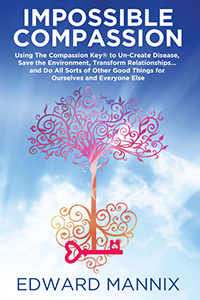 In his second book, Impossible Compassion, Edward Mannix takes on our assumptions about what is possible and impossible for us as individuals and as a species, and he provides us with a new paradigm and a simple yet powerful new tool—The Compassion Key®—which together enable us to achieve that which was previously unachievable. Changed My Life Forever! Read This Book, Try This Method! “I have experienced directed compassion work first hand with Edward in a one on one healing session, and he and this work had a transformational impact on my life, and the life of my husband and our then yet to be conceived child. “I was so excited when I heard that Edward had written a book about the powerful, life-changing work that he does. I want so much for other people to benefit from it, especially other women who like myself have had trouble getting pregnant or carrying a baby to full term. Reading through his new book, it contains clear instructions and numerous examples of how to do exactly the process that Edward led me through in our session together, and that led to the life changing results I experienced. “Prior to my session with Edward and working with directed compassion, I had 3 miscarriages in a period of about 4 years. The third was the most traumatic because the pregnancy failed when I was already 5 1/2 months pregnant. I didn’t think anything could go wrong that late in the pregnancy. When it happened the doctors couldn’t tell me why it had happened, and I think one of the hardest parts was not knowing or understanding what went wrong. “Almost a year later, my husband and I had been continuing to cautiously hope for another pregnancy, and a successful one, of course. But we weren’t conceiving, I think I was a little scared to conceive anyway, and I was starting to question whether it was meant to be. I was already 42 years old and beginning to envision my life without a child. I had recently met Edward in massage therapy school where we were in the same class, and I had a dream that he put his hand on my stomach and that I was able to have a baby. Which is pretty much what ended up happening, except not exactly. “In stead of putting his hand on my stomach, he explained to me that isn’t the type of healing work that he does, that instead he can guide me through a process where I would heal myself with my own compassion. We spent about an hour and a half together. Following the process outlined in his book, he helped me find the root cause of the emotional pain around my failed pregnancies, which I quickly realized was also most likely the cause for the miscarriages themselves. “I gave myself compassion for unresolved trauma and guilt stemming from an event I had experienced earlier in life. I cried. I had a big release and felt light and like a big weight had been lifted. The next thing you know I’m pregnant. Literally, I conceived within less than 2 months of working with Edward and doing the compassion healing, and I knew then as I know now that it was our work together that helped me bring my child into the world. One time, 90 minutes, no follow-up sessions with him, no ongoing exercises by myself. I experienced a totally and forever life-changing healing doing this technique just one time, clearing the way for my baby boy to arrive. “I had a trouble free pregnancy, and as of today my 2 year old boy is totally healthy and is the light of my life. I knew I wanted to have a child, but as I started to feel that possibility slip away a few years ago, I thought my life would still be great and I would still be happy even without one. I know this would have mostly been true because I have a great marriage and I’m generally a happy person, but I really didn’t understand what I would have been missing out on. Knowing what I know now, I truly can’t imagine my life without my son in it. “I can’t recommend this book highly enough. I want everyone to read it, and especially other women in a similar situation like the one I was in. I would definitely consider trying directed compassion before spending $10,000 or $20,000 on an in vitro package. “I know sometimes people can become skeptical of healers and various healing techniques, but there are some people out there who just have it, a special gift, a direct connection to spirit or Angels or God. Best Ever Self Help Information! I purchased this book on the recommendation of a friend. I love it! I am a counselor with a PhD and have found more help in removing blockages in myself with The Compassion Key than in most of my counseling education. I have taken Edward’s first and second/third levels of training and it has been an eyeopener. The book is a stand alone or wonderful adjunct to Edward’s classes. I highly recommend it to anyone struggling to get past issues and into the joyful present! How to Shed Heavy Baggage – Quickly! “If you have a strong interest in freeing yourself (or others) from numbing heavy baggage from the past, this book delivers a compelling strategy. It is a very honest presentation that spells out how the author has arrived at his viewpoint and how he continues to search and improve his theory and practice. When you do the exercises in the book, you notice for yourself that this is a short and direct way to improve your life and how could that not be amazing! Great Book for Pain Relief! “I had struggled for three years with interstitial cystitis, and had recently read The MindBody Prescription, as well as Abigail Steidley’s e-book on healing using the mind. I found Edward’s book, Impossible Compassion, to be a fantastic companion piece to those. The ideas expressed in it helped confirm and reinforce things I was coming to terms with, and is a great tool to use as a reference later, even after you’re doing reading it. “I’ve heard a lot of lip service given to the concept and practice of compassion but this is the first time I’ve seen it so gracefully and elegantly presented as a life-changing tool. “We all yearn to be the very best that we can be, to make a difference in the lives of those we love, to be a contributor to the greater good. Impossible Compassion promises us that we can do all of that…if we embrace compassion. “Edward Mannix guides us in how to direct our compassion to change our lives and the world around us. His writing is both inspirational and practical (which is remarkable!) and his message is powerful. “As a soul on my own journey and as a counselor with 27 years of helping my patients be their best, I have embraced Mr. Mannix’s message. I have personally experienced the power of what he has to share and, professionally, I see the role directed compassion can play in the lives of my patients. “So read this book and then read it again and then, perhaps, again! Impossible Compassion adds important new insights to the collective dialogue and powerful new techniques to our collective toolkit. It is a must read for any serious student of healing, manifestation and spiritual transformation… or just anyone wanting to use cutting edge spiritual knowledge & tools to better their life and the world.